When it comes to indoor POE Intercom systems, CyberData has an excellent offering. The indoor options are priced really well and there are no other system parts to buy ! All secure entry devices, for VoIP networks are PoE enabled. I don’t think we need to explain what Power Over Ethernet is. However, for anyone who is still a little unsure, see this external page here. The cyberData range of door phones are 2 way full duplex audio only. We do not have an integrated Video option. The best selling is the dry wall mounting indoor POE intercom. This is available in two versions. As a call button only intercom. Or as as 12 key keypad with the ability to call multiple extensions. 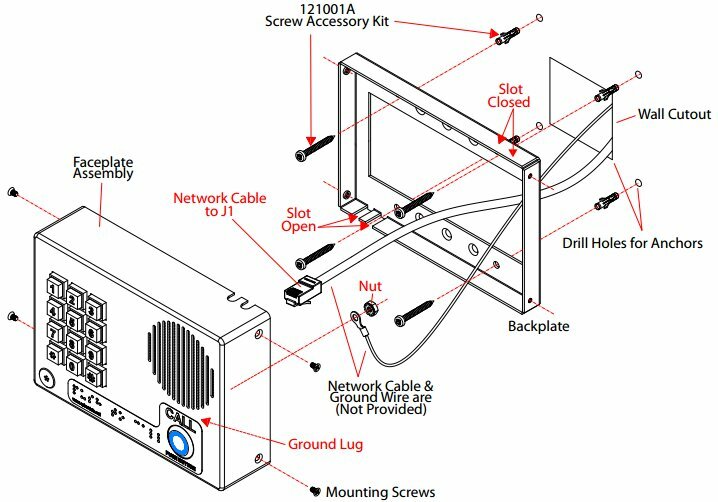 In this post we are going to look at the basics of the installation. We are going to take a closer look at all 5 models. We are going to list some of the most popular features. The indoor POE Intercom features an integrated Dry relay contact. This will trigger an external relay. IP Phones. Softphones and Mobile phones trigger the relay. The Intercom is used for remote operated access control. With a 12 key keypad you can place calls to anyone. Simply press the call button for a dial tone, then make a call. You could set the call button to place a call to a single extension, This could be used in situations of duress or if an emergency situation occurs. CyberData also manufacture a red coloured emergency intercom. All CyberData door phones feature a 2nd SIP extension. This can form part of the event and emergency notification paging system. Could you install a TV bracket ? if you look at the image below. You will see the surface/wall mounting layout. The indoor door phone has a metal frame that sits inside the main device. You drill and attach this to the wall. Then the main outer keypad with PCB board screws into the frame. Depending on how handy you are with a drill. This should take no time at all. When integrating the indoor POE intercom to a SIP architecture you just need to know your SIP servers details. Like any IP device, the intercom is web-page configured. 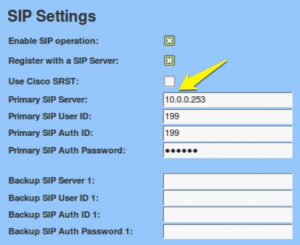 Click on the SIP config page and register the endpoint to your SIP server. 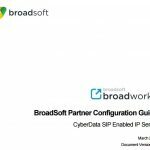 The solution works with Cisco Call Manager, Broadworks by Broadsoft and Asterisk to name just a few. This part of the installation is just like setting up an IP Phone. 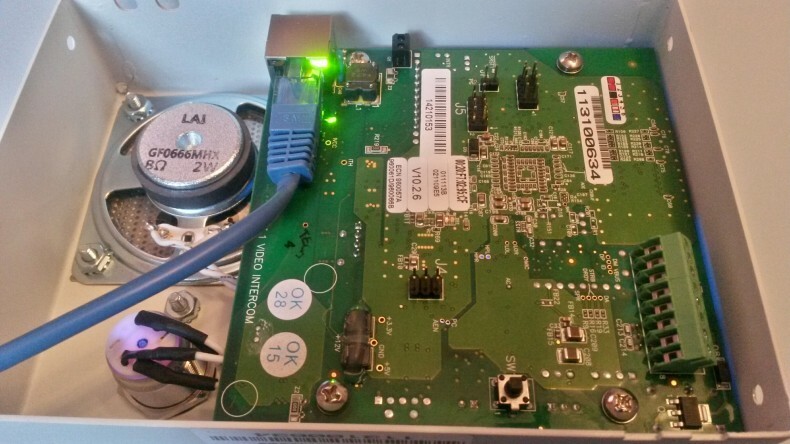 Connect the IP intercom to the SIP server / IP-PBX. The from the voice platform, set the device up as a new user and extension. The SIP enabled IP endpoint is now integrated to the on-site or hosted telephony system. The relay or I/O board on the PCB board is triggered by endpoints within the building. The most commonly used are IP Phones. However, if you have a SIP trunk in place, a method to make calls over the PSTN then you can call a mobile. The I/O board is triggered and this in turn opens a door. The above images shows the PCB board on each POE Intercom device. Top left: is your RJ45 port: We have all seen or used one of these before ! Hook your Cat5e cable up to it. Plug the other end into a POE port. You now have power and internet connectivity running to the device. SW1 Button: Bottom of the PCB board. Press and hold this for around 3 seconds, the device will play its auto configured IP address over its speaker. Bottom Right: Is the I/O Board. Also know as a “DRY Relay Contact”. In a door entry application, this usually triggers the external relay. For automated gates and barriers the NO contact is usually adequate enough to driver the gate/barriers controller unit. CyberData build a powerful and compact range of outdoor and indoor POE IP intercoms. The outdoor models are used at door locations and site entry points. The indoor options include: Flush mount and wall mount and with and without keypad. They integrate to 36 tested VoIP platforms (to date). The oldest partnerships are Asterisk, Avaya and Cisco. The more recent ones include: Broadsoft and LG Ericsson.